As I mentioned in my previous post, we are big fans of Thomas Jefferson. Over four and a half years ago we chose to adopt a vegan diet, which means we do not eat any animal products whatsoever. We were thrilled to come across this quote from one of our heroes! I am reminded just how lucky we are to have dairy free condiments for our vegetables these days. We are blessed to have made this choice when it is so easy to eat delicious amazing whole food with wonderfully tasty combinations that don’t include the use of any animal foods. We don’t need animal food to eat well. Over the past few years when people are inquiring about the reasons why and such, many times someone will say to my husband, “Man, sorry about that, that sounds terrible.”…or something similar. I love how he responds. He gets quite enthusiastic and talks about how exciting it has been to try something different. He goes on and on about how we ate the same things for years and with this change we got to figure out what tastes good to us now and embark on an entire new food adventure. He tells it as a fun and thrilling story. He is a great example of — it’s all in how you look at it. Love him for that and much more! For me personally, I could go on and on about why we made this choice…it started for one reason and morphed into too many to count. If people ask, I do love to share some of those reasons. As it has become completely familiar and normal to us over the years, I realize that there are many unexpected outcomes from making this lifestyle choice. The biggest one I feel is very close to my heart and means a lot to me, but it may sound strange to others…I feel much more open to life and much more in touch with my heart and able to understand and embrace things in a deeper way. I actually feel that eating life and whole foods rather than having death on my plate has changed how I live in the world. 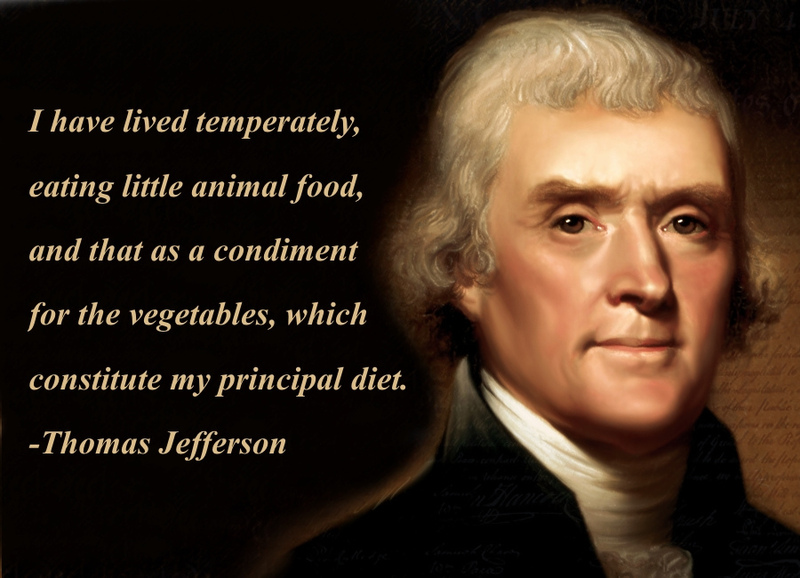 I love this quote from Jefferson, it makes me imagine his food choices somehow shaping who he was in the world too. For some reason it thrills me. Wishing us all plates full of life!